Regardless of where you go this winter, cold snaps are inevitable. The good news is you can do something to prepare for those brisk days. Here are three ways to keep your RV warm in winter. A secondary heat source is helpful for RVing in winter. Image: iRV2 member Mau Mau. Ditch the expensive and dangerous space heaters for a secondary heat source. 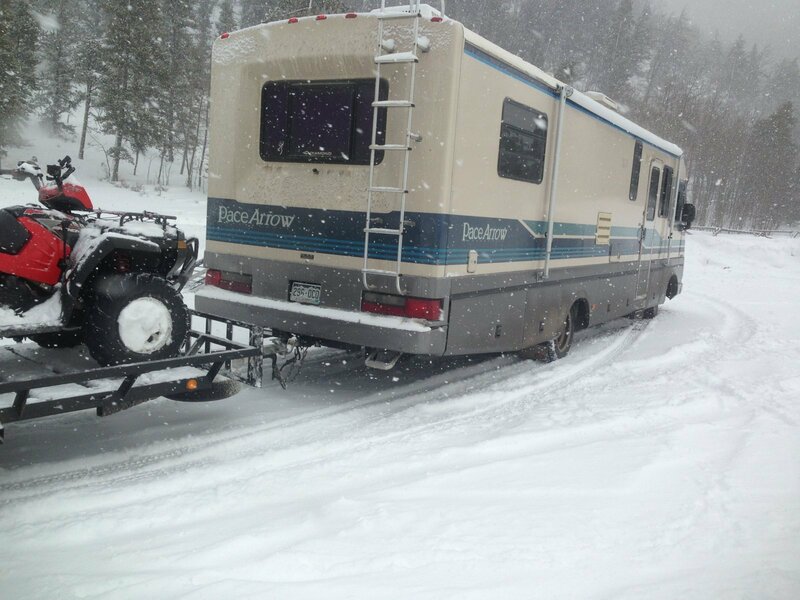 In his RV Life article “How To Avoid Winter Camping Problems In Your RV,” boondocking expert Dave Helgeson suggests a catalytic RV heater or an oil-filled electric heater. “Your built-in forced-air furnace should always be the primary source as the ducts are routed to keep the plumbing from freezing and keeping the occupants warm. Further, a secondary option are oil-filled electric heaters. 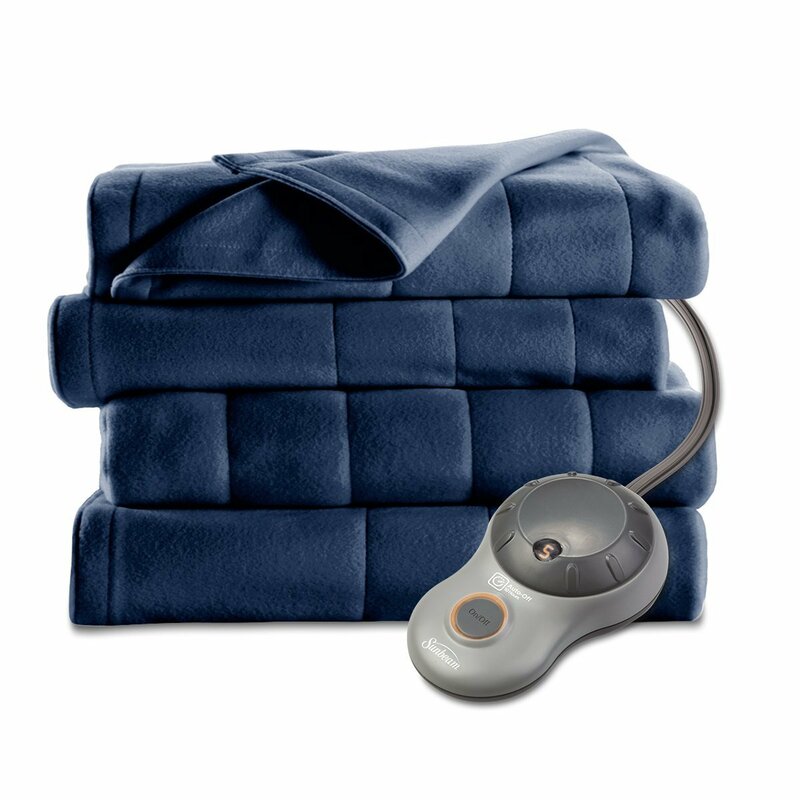 Save money and warm up with an electric blanket. Don’t want to invest in an extra heater? 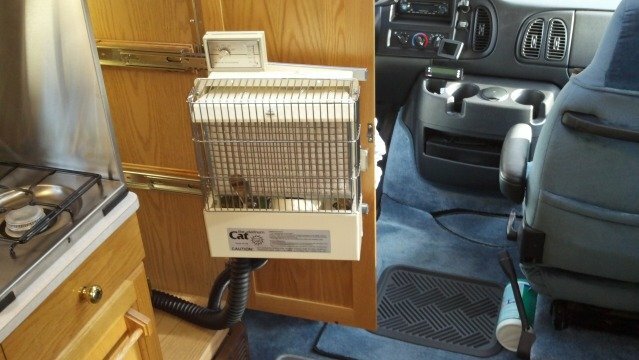 If you’re plugged in, it’s an easy solution to keep warm in your RV. According to Russ and Tina DeMaris’ RV Life article “Keeping Warm in Your RV,” an electric blanket can do the job and save money too. “Here’s the skinny: A typical queen-sized electric blanket has a draw of 200 watts, and an estimated duty cycle of 50 percent, meaning on a cold night, the blanket is “on” and consuming 200 watts half the time. For a 10-hour night, that would mean a power consumption of 1,000 watts (or one kilowatt hour) based on a formula of 200 watts x 10 hours x the 50 percent duty cycle. 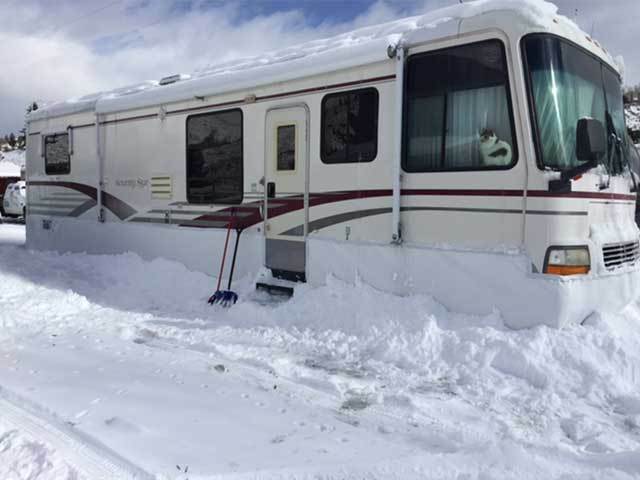 Are you a snow lover who wants to live in your RV in snowy weather? If so, you’ll be smart to follow the tips from Ching and Jared, aka LiveSmallRideFree.com. Their helpful DoitYourselfRV article “How to Skirt Your RV in the Winter to Keep it From Freezing” shares the ins and outs of skirting your RV with insulation material. “This is one of the most important things to do if you’re staying somewhere that gets below freezing (don’t forget wind chill) for long periods of time. Especially if your rig doesn’t come with a winterized set-up that includes a covered and sometimes heated underbelly, heated tanks, etc. If you plan to continue RVing in winter, get ready now with these preparations to keep your RV warm wherever you travel or stay put for the season. For more great tips, the iRV2 Discussion Forums are another great resource for even more winter RVing ideas. We lived in our 35′ Itasca in November and December while our house was being built with temps in the 30’s and some snow here in VT. The gas furnace running and 3 electric heaters running and it was still cold. I had pillows in ceiling vents to kill those breezes. Very glad when house was completed. It is a LOT cheaper to heat a house than a motorhome. Wow I keep my rig at night @ 65o And @ 78o during the day but i do not add any extra clothing ! Still t shirt and levis . i use electric heat, and have my 36000 BTU PROPANE furnace set at 65o in case of power failure or extreme drop in temp also have 2 12 v fans running to circulate heat from ceiling ! Yes, I would think this is fun for about 2 nights! Winter camping can be a lot of fun. I normally keep the temp about 50 at night (great sleeping temp) and turn it up to 60 during the day. My heat pump a/c or gas furnace are not working particularly hard and I can always fire up the fireplace. Coldest temp so far is 5 deg. Spent the “worst winter in a hundred years” in South Dakota back in 1990s living in a Gulf Stream 28ft trailer. I made inserts out of expanded polystyrene for all the windows & Superfan (I’ve been told that’s a fire hazard). I skirted the trailer with hay bales and buried the fresh water hose in the bails. I heat taped the fresh water hose and the sewer hose (sewer hose heat only turned on when dumping the tanks). I had two electric space heaters and the propane furnace. The heaters and furnace were on thermostats and cycled about 50% on time even with 30 below 0 temps. Refilled two 40# tanks 2-3 times a month. Only problem I had was the tank crossover valve tended to freeze around 20 below. The following winter I found the furnace blower bearings were worn out when I tried to run it.. All-in-all not a bad experience. Of course 8 ft of snow on the roof and 15 ft drifts kept the wind chill effects minimized. Opps 8 ft of snow is very heavy , This could cause a serious problem As it starts to melt and gets heavier . We now own a 1996 Mountain Aire. Two 1500 watt space heaters keep the coach warm down to near zero. If we’re not winterized we run the furnace to keep the bays and plumbing warm when traveling. We’ve left South Dakota for Christmas with the coach plowing snow and the heated mirrors frozen over. We’ve found that running the water heater keeps the rear water bays warm but the front bay has the water pump which requires the furnace warm air. None of our tanks have blanket heaters. When we’re on shore power we use two additional space heaters connected to freeze switches in the water bays to avoid burning propane. Never had a problem keeping warm in the winter. I have found that switching to an electric mattress pad from an electric blanket keeps me much warmer at a lower set temperature so it cycles even less! We use an electric mattress pad when we camp in early spring and late fall. So nice to crawl into a warm bed! 200 watts x 10 hours x 50% is 1000 watt-hours, not 1000 watts. 1200 watts x 10 hours x 50% is 6000 watt-hours, not 6000 watts. I always pull my slides in. It reduces the area to be heated and seals around the slides better to prevent drafts. I also put up a sheet floor to ceiling between the front dash area and the rest of the rig. Makes a high difference. And a heated mattress pad is a must. Just like back on the farm.